I spent 41 years being loved, raised properly, emotionally supported and cheered from the sidelines by the same man. I was tucked in bed, taken on incredible vacations, comforted after a bad dream, comforted after a terrible date, and lectured over a thousand times by the same man. I learned to swim, ride a bike, shoot a basket (kind of), jitterbug and appreciate big band music from the same man. To this same man, I pretended to ignore his advice and feign embarrassment and act like my problems were none of his business for a stretch of years. In reality, I hung on this man's every word...every word...for 41 years. I was taught to catch a typo, write a good letter, work a room, respect my elders and give a good handshake by the same man. For 41 years, this man made me feel like I could walk on water...but I knew that was because he was holding me up. I learned to love without conditions. He loved me when I gave him reasons to brag. He loved me even more when I royally screwed up. He loved my brothers - and I see so much of him in them. He adored my sisters. And, lucky for all of us, he loved our husbands and wives. I think each one of them would say they felt like he treated them like they were one of his own. He showed us that a marriage is never perfect...but your love for your spouse is. He wasn't afraid to proclaim his devotion to our Mom. He's grab her for a smooch in front of anyone. He'd grab her for a slow dance in the kitchen while dinner was on the stove. He would randomly bring home a single red rose for her...brag about her...and write her poems. His last words to her before he suffered a massive stroke in his sleep - "Happy Birthday!" And days later she would discover that before he went to bed on the eve of her birthday, he composed his last love letter...his last poem...almost like he knew. My sister said it best in her beautiful eulogy. The girls wanted to BE our Mother...and MARRY our Dad. He was full of love...for everyone. One of the most emotional moments in the hospital was between him and my Mom. Their "song" was "Always," by Irving Berlin. I downloaded it to my phone and placed it on my Dad's pillow. We all watched...sharing a box of tissues between us...as my Mom gently took his hand and closed her eyes. She smiled sweetly and swayed with the music. When the song was over, she slowly opened her eyes and said, "Well, Tom...we just had our last dance." I learned so many lessons from this man. My favorite story was the one he would tell about his own Dad. He would describe his Dad as a "simple carpenter" and every time he spoke of him his eyes were filled with admiration. My Dad, in college at the time, was sitting at the kitchen table doing some difficult Trigonometry. His Dad, peering over his shoulder, asked if he could help. My Dad scoffed, saying "What would you know about Trigonometry, Dad??" And then his Dad sat down...and showed him just what he knew. I heard that story so many times in 41 years...and it would always end this way: "Kate, don't ever think you're so smart that you can't learn from someone else." There were so many things my Dad had a right to brag about. But he never would. There were so many acts of kindness and times that he "saved the day" for people - and would either never tell them (or anyone) or never want credit. My Dad practiced "Random Acts of Kindness" way before it was cool. He didn't get caught up in the trappings of materialism or social status. There are so many things that people may not know about my Dad. He was so smart - in math, history, english, world affairs. He was creative - wrote plays, song lyrics, could sketch. He was a great singer. Ok, maybe not that. My Dad loved to volunteer and I think, perhaps, it could be my favorite quality of his. He grew up very poor in a rough Philadelphia neighborhood and he knew what it was like to go without. He was always looking for ways to help others. My Mom would tell a story of him dressing up as Santa and delivering toys to a poor (and large!) family in their neighborhood. Never wanting recognition, he would just leave the bag of toys on their doorstep. He would tell me he'd never give money to a beggar on the street - he knew it would go to something unhealthy. Instead he'd say, "Are you hungry?" and often take them to get something to eat. He would pick up hitch hikers (before the world went crazy!) and get them safely to their destination. When I was in high school, I decided to boycott Thanksgiving dinner with the family. I wanted to spend the day with people less fortunate - less fortunate in resources and in family. Instead of forbidding me, my Dad joined me a few times. And then he joined me in visiting elderly shut-ins on Christmas day. When planning his funeral and writing his obituary, my Mom asked that donations go to the Salvation Army. Why? Well, when my Dad was in boot camp for the Navy, he took a trip home to visit his Father. He fell asleep in the bus station and his wallet was stolen. Turned away by other charities, it was the Salvation Army that gave him the bus fare to get home to see his Dad. My Dad never forgot that - and has been loyal to the Salvation Army ever since. In his honor, I would love for you to remember that story this holiday season. When you see the Salvation Army bell ringers - drop in whatever you can. A nickel...a quarter...a dollar. And when you do, think of my Dad...and his generous spirit. His first grandchild, Emily Grace, was born in 1988 - the year I graduated from high school. He went on to add 19 more. I secretly envy all the grandchildren born before his first stroke in 2003. He was able to swim with them, hit a baseball with them...and simply hold them. But after his stroke, he still interacted with his grandchildren and even learned to hold our babies with his one good arm. When Gavin was born and in the NICU, he came to the hospital and sang to him as he held him in a rocking chair. He and Gavin had a special bond - two guys whose muscles didn't work very well. Two guys who needed assistance. Two guys who had a determination that was amazing to watch. And Brian...he loved his Pop. They shared many laughs together. His death was inevitable, we were told. The stroke he suffered was so massive that there was no way he would recover, we were told. Five children and my Mother - some grandchildren and some sons and daughters-in-law all crowded the room from Friday to Sunday night. He had a living will - no extraordinary measures. Part of me was okay with that - thinking he was extraordinary enough to survive without them. Make the greatest comeback of all time. But most of me was devastated. I was obsessed with how "no extraordinary measures" would affect him. Would he suffer? Would he feel like he was suffocating? Drowning? Would he feel abandoned? Lonely? Scared? Would he feel pain? My mission was to ask a ton of questions - get all the facts - and stay on the nurses to make sure he got his pain medications. I needed to be busy - have a job - and that was it. My Dad would have done the same thing for me. For anyone. The night I slept in the bed next to his, I set my phone's alarm for every two hours. If the nurse didn't come in with his morphine, I was out in the hall looking for her. I was obsessed...it was how I dealt with feeling SO out of control. I knew he wouldn't die the night I was there. I knew he wouldn't die in front of any of the women in our family. He was too protective of us. The next night, my brother Mike said he'd sleep over. My Mother, my two sisters and I kissed him goodbye after 11pm and went home. I was just crawling into bed when my brother called. He had the privilege of being there for my Dad's last breath at 12:15am. My Dad was there for Mike's first breath...and Mike was there for my Dad's last. I had a hard time throughout all of this ordeal with leaving my Dad's body. I never wanted him to be alone in the hospital bed - and he wasn't ever alone for long. The night he died we all waited until the funeral home came to pick him up. As much as we LOVE this funeral home and it's funeral director - as much as we trust them - the feeling of giving up control of my Dad's helpless body to someone other than family was so difficult for me. I dealt with this by finding a job. I made sure the funeral director knew my demands - make sure he's clean shaven...trim his hair - he's a well groomed man, you know! He combs his hair from left to right. No makeup! I was...obsessed. And the funeral director was...patient. And very understanding. When we were finally able to see him at the viewing, I found myself brushing lint off of his suit like a fussy wife. Making sure his collar was flat and smoothing out his hair. I wanted him to look as perfect to the world as he was to me. It was just how I dealt with it. By far the hardest moment? Driving away from the cemetery. Leaving his body alone. Sure, I know it's just a shell - I know it's not "him". But the thought of leaving his body behind is more than I can bear. The arms that held me as a baby...the hands that let go of my bike...the legs that creaked up the stairs and prompted me to quick jump in bed...the back that carried so many of my burdens...the face that was always quick to smile, share a story or a song...and make me laugh...the head that was filled with knowledge. I'm finding it very hard to let go. Very kind people have been saying to me over the last week, "He'll always be in your heart" and "You'll see him in your children" and "You'll feel his spirit" and "You have your memories." I appreciate all of that - and in my head I know it's true. But these people never had a 'knocker' from my Dad (a special kiss that makes everything better - always). They never felt his great hug. They were never swung around on the dance floor with a crowd of people cheering and smiling. They never snuggled up in his arms like I did - even as an adult. His body...his physical presence means so much to me. I sure hate it when people say, "He/she looks so good." when they look into a casket. But I said it. My Dad looked handsome, dignified, and peacefully asleep. I didn't imagine saying "That was a beautiful funeral," but I did. 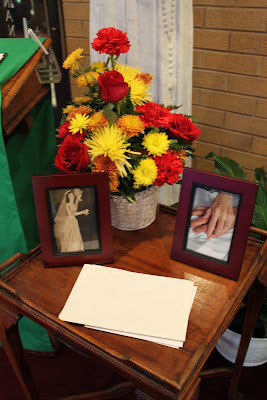 The music, the homily, the flowers. Three incredible eulogies given by my brother, Mike, my sister, Meg and my brother, Tom. Over 400 people attended his funeral mass alone. His sendoff began at 11am on 11/11/2011...Veteran's Day. I felt like I was greeting a never ending stream of friends, relatives, and...quite frankly..."fans." My Dad was well liked by everyone. It was a devastating day for each one of us...but I felt like it was a tribute befitting a superhero. My original superhero. I also realized just how important support is now that I've seen the "other side." I was grateful to see a neighbor, a high school friend and a few close friends that came for me. It meant way more to me than I imagined it would. Thank you to everyone who came to say goodbye to my Dad. The military ceremony at the cemetery was moving. Taps, gun salute, the folding of the flag. There was a big mistake when they announced him as a "Petty Officer" when, indeed, he was a Captain in the Navy. But my humble father would have laughed that off...and maybe not even corrected them. By far the greatest gift my Dad gave to all of us? He taught us all the importance of having a positive attitude. He would say things like this: "If you were in a room full of people...and everyone threw their problems on the table...you'd grab your own and run! ", "Adversity makes you bitter or better," "Winners never quit - and quitters never win," and, always, "Keep the faith." My Dad could spin any situation and somehow see the positive. He never let anything "beat him." I know I've written this a hundred times, but when he had his stroke - it was SIX months before my wedding. I was the last of his daughters to walk down the aisle...his baby. For years we had planned our dance - our own jitterbug routine. Others around him in the rehab center gave up...gave in...but not my Dad. For him, this was just a blip in the radar. He worked so hard and on my wedding day he walked down a very long aisle holding onto nothing but my arm. Since 2003, my Dad never...ever...complained about his condition. He worked hard to stay as independent as possible. He had the best attitude. I was always inspired by that - and strive to stay positive even when it feels hard to stay upright. I will remind myself of my Dad's positivity and his great attitude when I find myself missing him. When I feel angry that he won't be here to see Gavin take his first solo steps. When I feel sad that he won't be here to hear Brian start talking. I will remind myself that in Heaven, my Dad now has legs that work...arms that are free...a heart that is un-burdened...and ears that can hear all of my daily updates. And, perhaps my greatest comfort, he can hold Darcy Claire in his arms until I get there. I love you, Dad. I will miss you forever. And even though I feel my world has been turned upside down at the moment...I promise...I will keep the faith. It is with great sadness that I report that my cousin, Jean, and her husband, Kevin's gorgeous teenage daughter, Caroline, tragically passed away. She suffered a massive asthma attack on November 7th which triggered cardiac arrest. After spending all week on a ventilator, she passed away last evening. As a mother, it is very hard for me to process this kind of loss. Jean and Kevin previously lost a son, Michael, who was born still. She was a great support to me when I lost Darcy. Please keep Caroline, her twin brother, Jimmy, and her younger brother Jack in your prayers...along with Jean and Kevin and their families. I have such a large group of supporters through this journal - if each of you says a prayer, sends positive thoughts, or even writes an encouraging note on the CaringBridge page they set up for Caroline...it would mean so much to me. It's something small when I wish I could do SO much more to comfort them. God bless Caroline. And Dad...I know you will take care of your favorite cousin's granddaughter. That was beautiful Kate...brought tears to my eyes as I think about my own parents and realizing how lucky I am to still have them both. I am also so sorry for the loss of your cousins daughter. So sad for a life to be cut so short. I will continue to say prayers for your entire family! Beautiful and moving, Kate. You will carry him not only in your memories, but in the way you live your life. You obviously learned his lessons well. Amazing tribute to your father. You are obviously his daughter and he must be very proud of you. Kate, that was beyond beautiful. Your love shines through, and so does your father's amazing spirit. Now it is very clear how you turned out as wonderful as you are. Such an eloquent tribute. You had an amazing relationship and now you have an amazing guardian angel. God bless all of you at this difficult time. Prayers and hugs to Caroline's family, also, as they grieve the loss of their beloved daughter. So beautifully written, heartfelt and purely genuine. A love like yours with your dad is unique and lovely. I hope that you find that writing helps heal your heart and strengthens your soul. Kate, as always your words are so touching and strong. Prayers for your family, and also for Caroline and hers. No one should ever have to bury a child. I wish I could say something to change everything that is happening, instead I'll just send you thoughts of peace and love. What a wonderful tribute to your father. I am so sorry for your loss. I'm a college friend of Jean's who found your site through her when Gavin had his eye problem. I am heartbroken for them. So many people I know dealing with loss right now. You are all in my prayers.